I had no recipe planned for today – I swear. 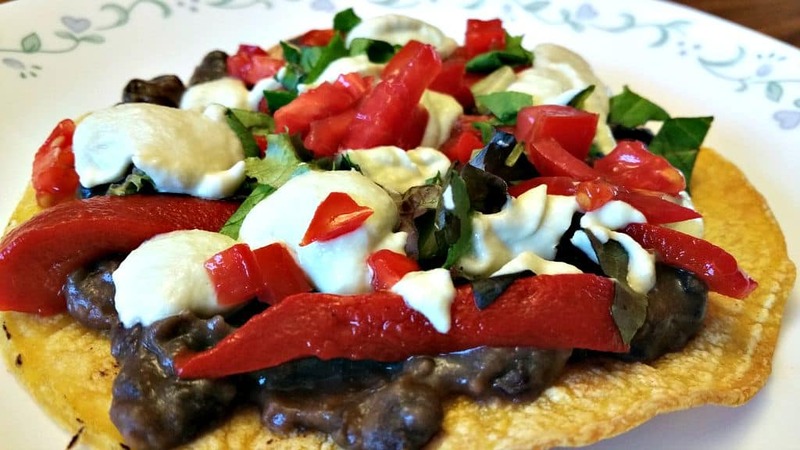 Somehow these Black Bean Tostadas with Green Chile Sour Cream magically appeared on my dinner table last night, and I have no idea how it happened! It was a typical Sunday morning, after a long week of work, and I went straight to bed. I did have a few recipe ideas floating around in my head to make this weekend – but this was definitely NOT one of them. I was simply too tired to even think about cooking. Funny how the best things usually just sort of accidentally happen, isn’t it? I got up late in the afternoon, grabbed a quick shower, still feeling TOTALLY exhausted, and wondering what in the heck I was going to eat. The wife was bathing our grandson, the daughter was sick in bed with a cold, I’m doing my usual “first day off from work walking dead” impression, and dinner was totally up to me. Great. Honestly the words “Take Out Pizza” did flash across my eyes – but only for a split second…. So I opened up the pantry and the very first thing I spied was a can of beans…..
Spice up those black beans, broil some corn tortillas for tostada shells, grab some ripe tomatoes from the garden, a few roasted red peppers, a little shredded lettuce ….hmmm – dinner. Honestly that’s how my sleep-deprived brain was working. 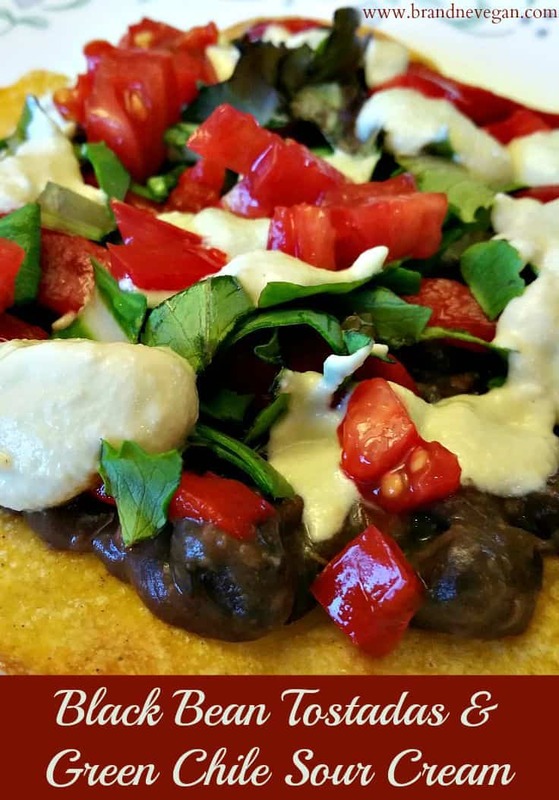 I had all the ingredients, it would be super quick to throw together, and it was healthy too….. all I needed was some Sour Cream to tie it all together. And guess what? I was out of Tofu which is usually how I make my Sour Cream. Seriously, I think this was where the real magic began, because I’ll tell you what – this cashew based, Green Chile Sour Cream I eventually ended up with is hands down…. The BEST Sour Cream I have ever made! I mean it is REALLY good! And all because I was out of Tofu. Funny huh? My wife getting ready to chow down on some Homemade Vegan Tostadas. Dump a can of Low Sodium Black Bean into a pot and turn the heat to low. Now add 1/2 can of refried beans and the spices and let that thicken up. I used a teaspoon of Masa Harina flour to thicken it even more. I learned this trick making my Vegan Chili. Masa Harina is flour made from ground up corn, and is used to make tortillas and tamales. Not only is it a thickener, it also adds a tamale-like taste to the beans. I like it – but it’s totally optional. You see the photo to the right – yep that’s an affiliate link and you know the drill. If you click on it and buy this product from Amazon, I’ll make a few pennies. Have to tell you that. I used roasted red bell peppers, shredded lettuce, and some freshly diced tomatoes on my tostadas. Some sautéed onions and green bell peppers would be good too – but I have to avoid the onions as they trigger my daughter’s Crohn’s Disease. Set your oven to 450 degrees and BROIL and let it heat up. Then place 3-4 corn tortillas on a cookie sheet and pop them in the oven. After 2-3 minutes give them a flip. Repeat the flipping every minute or two until they are as crispy as you like. This recipe will make 7-8 tostadas. Cover 1 cup of raw, unroasted cashews with hot water and let them soak for 30 minutes. Once they are nice and soft, drain the water and add them to a blender. Add 1/4 cup of hot water, the vinegar, lemon juice, garlic, salt, and green chiles and blend on high until smooth. Stop every now and then and scrape down the sides. The longer you soak your cashews, the smoother the sauce will be. I used about 4 whole canned green chiles, so they are naturally pretty mild. If you have access to fresh Hatch Green Chile, then I would just use one at a time until you get the taste (and heat) you like. Using canned chiles my sauce was not hot at all, but still had that wonderful green chile flavor. 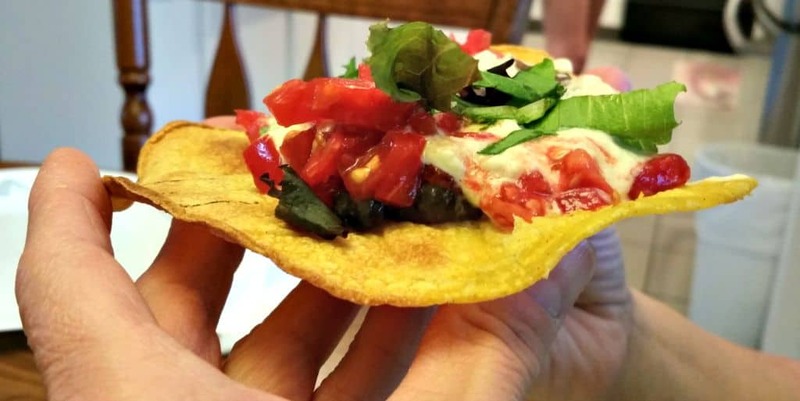 Lay a spoonful of beans on your tostada shell and spread them to the edges. Now top with the bell peppers, tomatoes, shredded lettuce, and some of that wonderful Green Chile Sour Cream. I’ll tell you again – this is now my GO TO Sour Cream Recipe from now on! It’s so rich and decadent, with tons of green chili flavor – absolutely perfect for Tacos, Burritos, or Tostadas. I even got my sick daughter down into the kitchen for a bite or two. 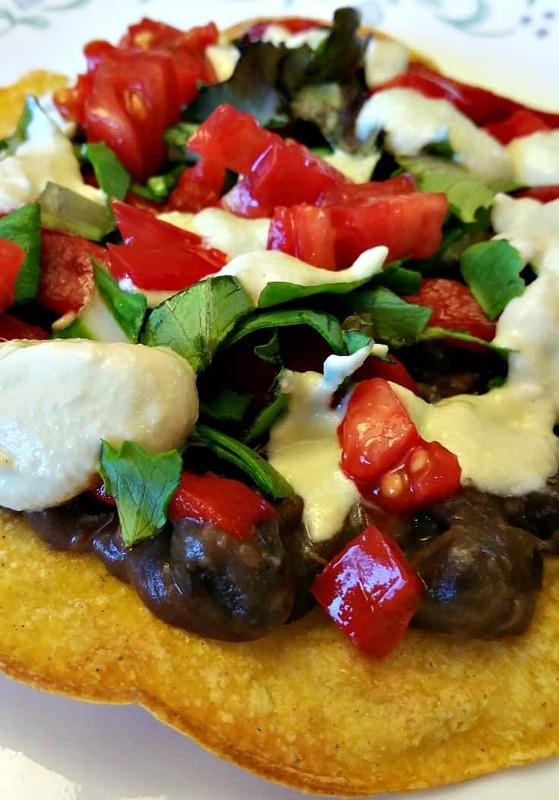 This Green Chile Sour Cream will turn any Mexican dish into a gourmet dinner - like these Black Bean Tostadas. So rich and flavorful. Who needs Dairy? Place all Bean ingredients in a pot and stir to combine. Add the Masa to thicken if desired. Place all Sour Cream ingredients in blender and blend on high until smooth scraping down the sides occasionally. Toast corn tortillas on a cookie sheet for 2-3 minutes at a time before flipping. Repeat until crispy. Place bean mixture on tostada shell and spread evenly. Rice makes a good side dish. This green chile sour cream is TO DIE FOR! !…it almost scares me!! Have you made it using tofu? I’m worried that this will become by go-to condiment and it’s not very conducive to weight loss! I may try it with tofu and see how it is. Let me know did you try the tofu version? Dinner tonight. Thanks, Chuck! Another of your great (and simple) recipies. I am assuming, you drain the black beans??? I must have done something wrong. The green chili sour cream wasn’t sour and it was the color of the brown cashews. I threw most of it away. The only thing I did differently was to use diced chilis, the whole can, because that is what I got by mistake. I made this for my Christmas dinner. I absolutely love this. The Green Chili Sour Cream is to die for! THis will be on my regular rotation of recipes. Another Green Chile Sour Cream fan….. Thanks! Glad you enjoyed it. Far exceeded my expectations. Speaking as a huge sour cream fan, your recipe is life-changing. Soooooo delicious!!! Thank you – you’re a genius. I love this and since my husband won’t touch sour cream (even if it’s made of cashews) and I don’t want to eat too many cashews all by myself, I decided to try it for other things besides tacos. Today I needed some mayo for a simple sandwich filling of chickpeas, dill pickles, and onion. I decided to try a taste with some of the left-over chili sour cream. It was delicious! (So now the recipe is going to have a note recommending to use the sour cream instead of mayo.) Consequently, I decided to add some to some left-overs in the fridge: a vegie medley of broccoli, cilantro, red pepper, black beans and sweet potato. Also delicious! Thanks for all your recipes. What are green chiles? Hot like jalapeno’s or milder like anchos? Are these fresh? I didn’t have the whole chili’s so I used a 4 oz can of diced green chilis. I also used WHITE wine vinegar rather than red (since I didn’t have that either). The rest of the recipe was the same and this sauce is DELICIOUS. In your comments about the sour cream you say to add garlic as one of the ingredients but in the actual recipe you don’t mention garlic. If you should add garlic, how much?? Also, when listing ingredients for a recipe, they should be listed in order of use. Your soup list of ingredients is out of order. For example the fourth ingredient is a can of tomatoes but it is added after all the spices are stirred in. Since I’m a cookbook editor I think these ideas will be helpful to you. Thanks for your many tasty recipes. In a pinch, those little cans of Ortega from the grocery store will do. But if you want REAL green chile flavor, you need to get some FRESH Hatch Green Chile, freshly roasted, and put some away in your freezer. Nothing compares….nothing. Without the green chili,does it taste like plain sour cream (for other recipes) ? Or would tofu be better for plain sour cream? It is creamy and tart….I made it without the green chilies otherwise my hubby might not like it. Adding it to the cauliflower tacos, changed to burritos for him. Poring red hatch salsa from Trader Joes on top…. I came across this on Pinterest and finally got to trying it. Delicious, slam dunk, put it on anything and everything ! This sour cream is brilliant on anything remotely Mexican food-ish. I am finally going to follow thru with making vegan tamales because this is what it was missing. Well done…changing the world one recipe at a time. Thank you. Finally got around to making these, and they did not disappoint! Your Green Chile Sour Cream was amazing!! I ate these for two days straight and decided to experiment a little.. 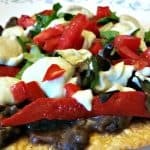 Using the leftover black beans, your Spanish rice and cheese sauce recipes, plus some taco-seasoned tvp., I spread these tasty components on the corn tortillas and rolled them into tacquitos and cooked them in the Instant Pot. Ohhhhhhh, if that wasn’t something very special!! I meant to say I made the tacquiotos in my AIR FRYER, not my Instant Pot, haha! WOW! Love the green chile sour cream… Delicious! Great recipe that is quick and easy. Thank you for all the work that has gone into creating this site! 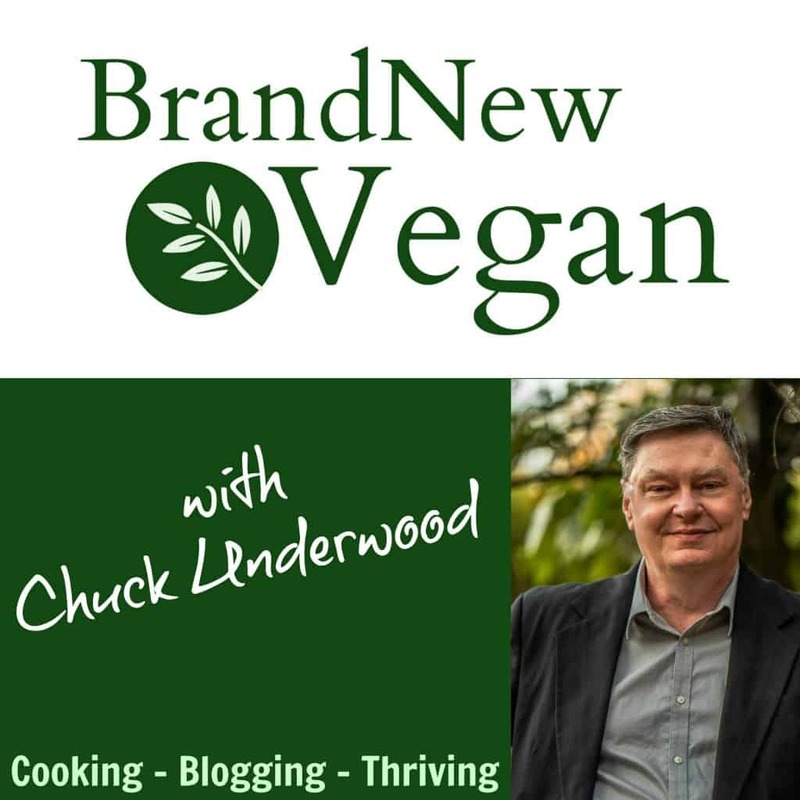 It is a wonderful resource for those trying to learn how to move to a plant-based diet (and personally for someone like me who is not a very good cook! Your clear instructions make it super easy to follow!) Grateful to have found your site!! So delicious! I added a T each of ground flax seed and nutritional yeast to the bean mixture, and loaded four tortillas with the mixture, chopped tomatoes, avocado, bell pepper, lettuce, and cilantro, and then added the “sour cream” with a squirt of lime. I also had Japanese brown rice topped with a mango salsa. I ate it all myself! I’ve just begun eating a plant-based diet, so thank you for this great recipe.